Blogging has become increasingly popular in the last 5 years. Today it has become so mainstream that it is difficult for a new blog to establish itself simply because there are thousands of blogs on every thinkable topic. It is widely known that popular blogs can generate a positive cash flow sufficient for a very nice lifestyle – this has further fueled the onslaught of new blogs. The sad truth is that more than 95% of new blogs fail to gather a significant readership and will be abandoned soon after launch. Today I am going to reveal the 2 most important things that you need to know to make your blog popular. These ideas are in fact so simple that almost everyone knows about them but most bloggers still fail to use these principles consistently. The fact that I am writing a post on something that most of us already know shows how important these ideas really are. The popularity of any blog is a direct result of the content the blog puts out and the marketing the blog is doing to get new readers. Content is the single and most underlying cornerstone of any blog. If there is no content there is nothing to read. If there is nothing to read no one will visit your blog. A potential reader can bookmark your blog after reading an interesting article but after several times of coming back and not finding new content the visitor will cease to return. Depending on the quality of your former blog posts it will vary how long this will take but after not finding new content the blog will sooner or later die out. It is also important to make sure that the content produced is high-quality. If the articles produced are inferior to the blog posts of your competitors there are no real reasons for a reader to follow your articles. There are probably hundreds of ways how a blog post can be low-quality – It can mean an article with a lot of spelling mistakes, a blog post that really doesn’t say anything new or a superb article that talks about something that is not interesting to your readers. Hopefully your blog doesn’t correspond to any of these categories. Producing new content is by far the most important principle of successful blogging. One has to keep in mind however that only concentrating on producing new and quality content is the best way to fail at blogging. In order to become a successful blogger you have to be consistently producing top notch articles and at the same time excel at the second principle of successful blogging – marketing your blog. Having great content is not enough for success. In order for your blog to become popular people will have to know that it exists. If William Shakespeare had never published his books he would still be a great writer with the exception that absolutely no one would know of him – none of his stories would have been made into plays. After writing a new blog post your goal should be to get as many people reading it as possible. If you don’t get people to read the exceptional content in your blog it can never become popular. By marketing your blog you give people the chance to decide whether what they are reading is worth reading for them. If it is – you can be sure that they will let other people know as well. That means that the more you market your blog the easier it will get – people who like your content will tell their friends about it. It is possible for a blog to grow big enough that there is no need for active marketing but this is only the case when a blog has thousands or tens of thousands of daily readers. If you think that you have enough readers and you can stop marketing your blog you are wrong. Choosing the marketing methods that work best with your blog or website depend on your niche and what exactly you want to accomplish. A good way to market could be anything from leaving comments on blogs with similar content or printing and handing out flayers in your the local mall. Producing and marketing your content only work hand in hand. You can’t have one without the other. If you have content but don’t have marketing you will never get any visitors. If you have marketing but don’t have any content your visitors will never return. Producing new content and marketing it are the two most important factors for a blog’s success. Contrary to what you would expect – at some point most people stop following one or both of these principles. As a consequence they will get little traffic, feel discouraged and eventually stop blogging. In order to combat the problem of not doing what I know should be done I created 3 simple graphs that help me stay in control of my article writing and marketing activities. At first glance this graph looks rather stupid – all the lines are parallel and they don’t seem to indicate much. The idea behind the graph is simple – it shows the every day goals of my blogging activities. The blue line represents the number of articles (1) I need to write every day this month. 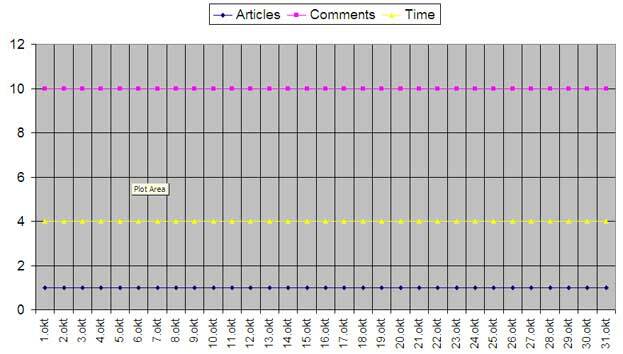 The yellow line is the maximum amount of time I am willing to spend on my daily blogging activities (4 hours). 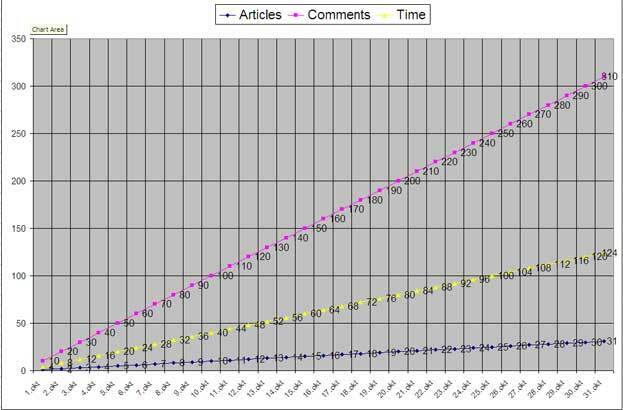 The upper line shows the amount of comments (10) I want to leave to other relevant blogs in order to market my content. I printed this graph out and every day after finishing my blogging activities I will draw a line representing the actual daily figures. If the hand-drawn lines fluctuate from the pre set one’s it will indicate a possible problem. This graph shows the total amount of work done after every day of reaching my goals. By the end of October I will have written 31 new articles, left 310 relevant comments on other blogs and spent about 124 hours doing it. This graph represents the expected rise in visitors and RSS subscribers if I manage to fulfill my daily blogging goals for October. Currently I have on average about 315 daily visits and hopefully it will rise to 571 by the end of the month. The amount of average RSS readers will hopefully go from 72 to 130. This is the only graph that represents the things that are not under my direct control. I can control how many articles I write and what I do to market it, but I can not directly control the amount of people coming to read my content – I can only make educated guesses. Control the controllables – focus writing new articles and marketing your blog. These are the only 2 things that you have direct control over. By consistently doing these activities you can influence more people to read your content. This is a repost of an article I wrote in October 2008. Since that time my RSS subscriber count has gone from 70 to over 350 and the average daily readership of this blog fluctuates between 600-1000 people per day! Keep in mind that all this has been done without any money! If I can do it, you can do it as well. For more insights about making your blog more popular sign up for our full feed RSS or sign up via email. You make a very good point with this post. There are only two main things in blogging that we can directly control and those are what we need to focus on. I also like how you remind us that we need to have a balance of marketing and content. As far as your tracking method, I like how it might increase motivation, but at the same time, I think you might be limiting yourself by using that method. can i ask u 1 doubt? where can i find the “recent posts” plugin u use here? does tht show rel posts from our site only na? bec i dont wanna lose my visitors when they come to the end of a post….plz help and gimme link to download d plugin..I have sub to ur rss…gr8 blog! Yes the plugin only shows posts from your blog. It is called “Similar posts” plug-in. Before you can use it you also need to install the “Post-Plugin Library” plugin. If you have any other questions I am more than happy to help! Should we allow trackbacks ? Bec some link to my posts and akismat blocks them as tackbacks. While moderating, i simply see they have an excerpt and a link to their post…should i despam trackbacks or delete them? whats ur opinion? Georgy I sent you an email with my opinion! Got it…thanks a lot….u r a genius…I must say. If you have any more questions, just send them to my email and I am more than happy to answer! I have read a couple of your articles – unique and interesting. To tell you the truth Leticia there is no 1 source where I get my ideas from. In fact it is probably safe to say that I get most of my ideas from different places. It’s true that I read a lot of books, blogs and listen to audiobooks (mostly self help kind of stuff). What I have found however is that you should always question what you are reading – sometimes just the opposite is true that you are reading. On other cases a thought by someone else can trigger your own idea. I agree that its a good find – it makes communication so much easier! hi sorry 2 disturn u agn…but the plugin changed d full layout of my comments section…Mine is a 3 column blog…the middle column spread out to take d space of all d 3 columns, only in d comments part of every post. This happened after activating d plugin. So i deactivated it temporarily. Any sol? plz help. SOS!!! Sorry to hear that it didn’t work properly! It seems that there is a conflict between your blogs template and the plugin. Since I don’t know almost anything about codeing and php – I can’t help you. I use the “Top 10 Posts/Views” plugin. Thanks a lot….OMG! You know everything! God Bless You. and thnx again. I really don’t know the solution to this problem – I get almost all of my traffic from other resources. I believe that people who find you through Google Image Search are there only for the pictures and don’t stay for a longer period of time – I could be wrong ofcourse! Ok Roman…so you are saying traffic via Google Image Search is not tht much useful…rt?….k. I don’t know about your or other websites but my Google Analytics tells me that the average referral from Google Image search only spends about 10 seconds on my website, while the site’s average is about 2 minutes. It’s clear to me that 10 seconds is too little for anybody to really be a good reader! but marketing is very tough to manage…. I like the graph you included. It’s good to project out the time you’re willing to spend on it. I should definitely incorporate the graph you showed. It’s true, at first when I looked at it, it didn’t make sense to me until I read the article. I came across your blog (http://www.financialjesus.com) while I was going through some finance blogs. You have shared with us very valuable information, I must say…Being impressed with your blog content, and I would like to place one relevant article to your blog and in return you link in my finance related website/blog. If you allow me to do so and give me an opportunity to show my blog/website to you for link exchange purpose, then kindly. Contact me at: dorothy786 [at] gmail.com. Like your tips, but it take a long time to make articles, post comments to market and advertise blogs or website. Love your topics. Keep posting! Entertaining log you have here. I actually made the mistake, very naive indeed, of paying for hosting, and a dot com.. and I’ve yet to even get the site up. It all comes down to lack of focus, having very little work available around here, it’s very difficult to even care. Yet not caring is destroying me. This is what brought me here, via Google. Todd, I was similar to you. After purchasing a hosting and a domain name, i was banging my head against the table numerious times. You really don’t know what you’re getting into when you’re really in it. The SEO, WEBsevvy, keyword search, monotezing… The list goes on! It took my a good 5 months of being active on my blog to actually get my website the way i really wanted it. I went and purchase books on CSS, Php, HTML, read alot of blogs and joined forums about SEO. Not long before that, i got some what of what blogging is like. Besides even if my website doesnt generate any income its totally fine. Blogging has become a great hobby of mines! Next post: Why Are Cheap Airlines So Cheap?